Because characters are so essential to novels, writers spend hours developing character sketches, running personality assessments on pretend people and recording the information in a workbook or on a vision board. 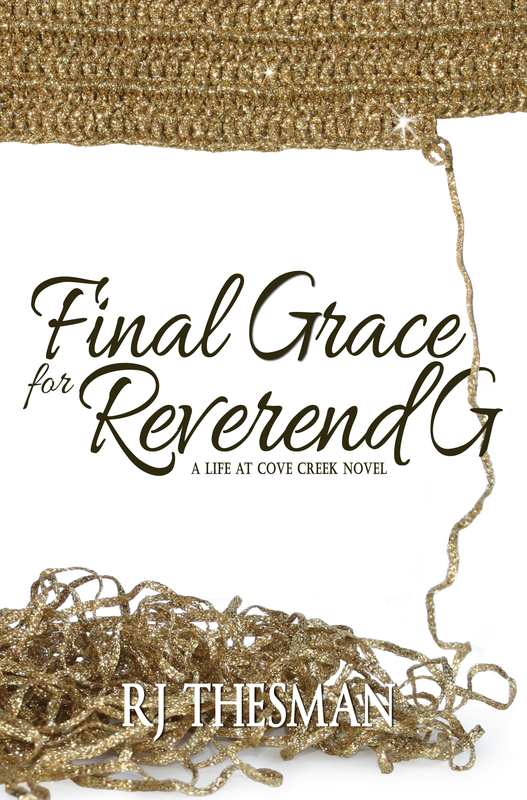 Since 2010, I have developed the character of Reverend G. I have lived with the voice of this gutsy little minister inside my head and written from her viewpoint what it feels like to experience dementia and early-onset Alzheimer’s. Now that the final book is scheduled for release on August 21, I feel a sense of loss. Reverend G fought Alzheimer’s with faith and hope, but she no longer wakes me up at four o’clock in the morning or reminds me that she wants to wear her long white braid draped over her left shoulder. She no longer scolds me when I am too tired to write down a piece of dialogue on the notepad beside my bed. She no longer challenges me to find just the right word that will describe how Zim – her word for Alzheimer’s – is stealing her away piece by piece. Reverend G’s voice has gone silent. So to acknowledge the loss and help me move on, my Saturday Sisters decided to initiate a memorial service. These sisters and I have done life together for over 20 years. We have prayed together, shared parenting tips and cheered for our Jayhawks. Except for me, they all live in Lawrence, Kansas. A few weeks ago, I drove to meet them at our usual gathering place, to celebrate together the life and legacy of Reverend G. We began with an introduction and the Lord’s Prayer because this prayer provided an important plot twist at the beginning of Reverend G’s dementia symptoms. Each of the Saturday Sisters shared their favorite stories from the two previous books, then we read Reverend G’s favorite verses: Psalm 46:10, Psalm 43:5 and Psalm 91:1-2. Then we prayed for those who suffer with Alzheimer’s and dementia as well as the caregivers who patiently listen to the same stories repeated over and over and watch their loved ones regress into childhood. We prayed for my mom and for the other moms represented around the table, sad that we can no longer “just call Mom” when we have a problem, grateful for the years we shared yet grieving for the fading away of relationships as our mothers now sometimes forget us. After our prayer, it was time for the luncheon. Don’t we always follow the sorrow of memorial services with the sustenance and fellowship of food? 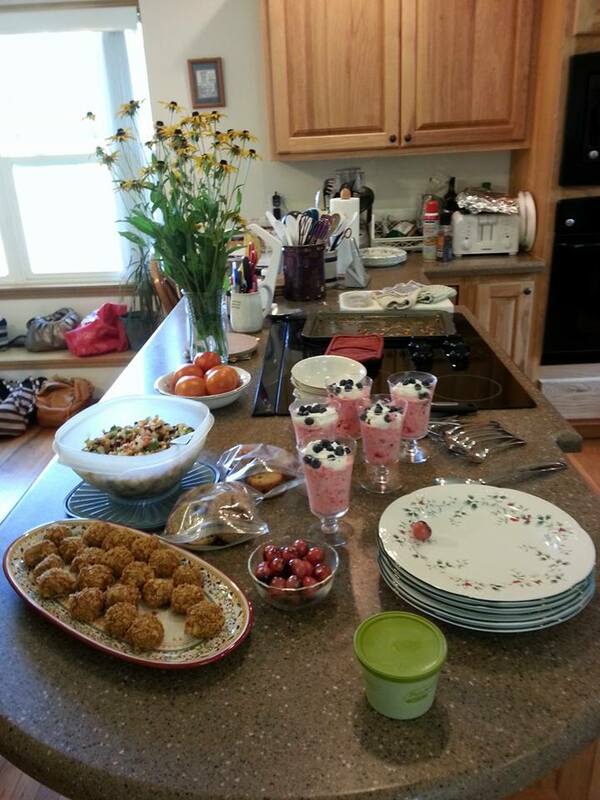 The menu included tuna balls (in honor of Gabriel, Reverend G’s cat), cowboy caviar, gluten free blueberry muffins, Reverend G’s blueberry salad, the choice of raspberry or plain lemonade and for dessert – of course – Chunky Monkey ice cream. 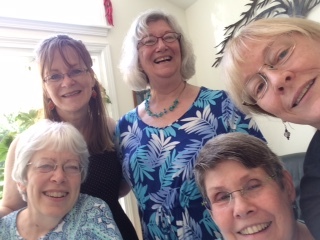 My precious Saturday Sisters spent a day encouraging me, believing that the character God and I created had made an impact on the lives of my readers. When we hugged goodbye – it was with joy and hope that someday Alzheimer’s will be defeated and no one will ever forget their loved ones again. Although Alzheimer’s still destroys pieces of my mother’s brain and my family still walks through this journey of forgetting – I can now – as a writer – move on. Thank you, Laurie. It’s been quite a journey! Oh Rebecca – that was wonderful. I’m so happy you have your Saturday Sisters and add my prayer to all of yours that someday we can stop the excruciating loss of our aging loved ones inch by inch and stop the worry we share thinking about our own future grasp of reality. Thanks, Evie – yes! I am so grateful for my Saturday Sisters and continue to pray for the end of Alzheimer’s. Speaking for all of the Saturday Sisters, we are so proud of Rebecca. She shines forth God’s loving care and hope. She is an example of listening for the voice of God’s guidance. We, the Sisters, are looking forward to the book launch of Final Grace for Rev. G. AND, the new RJ Thessman book whose characters are bossing Rebecca around now. Love you, Ginger! and your poignant comments on my blog posts! Ha- love it! Thanks, Jerry. Thanks, Bea! Hope to have a completed manuscript to my publisher by Christmas.